About the Book: WELCOME TO THE NEAR FUTURE, where good and honest 8/18 citizens can enjoy watching the executions of society’s most infamous convicted felons, streaming live on The Postman app from the suburbanized prison island Alcatraz 2.0. About the Author: Gretchen McNeil is the author of the YA horror/suspense novels POSSESS, 3:59, RELIC, GET EVEN, GET DIRTY, and TEN (a YALSA Top Ten Quick Pick for Reluctant Young Adult Readers, a Romantic Times Top Pick, and a Booklist Top Ten Horror Fiction for Youth) all with Balzer + Bray for HarperCollins. 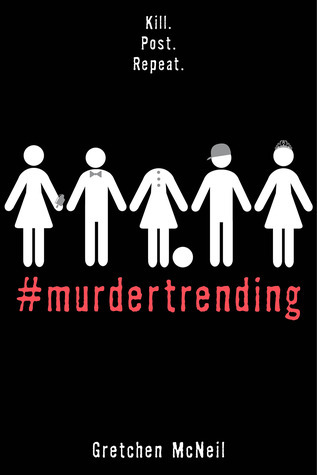 Gretchen’s first YA contemporary I’M NOT YOUR MANIC PIXIE DREAM GIRL, also with Balzer + Bray, hit shelves in 2016, and her next novel will be the horror-comedy #MURDERTRENDING for Disney/Freeform in August 2018. Notes and Opinions: Umm this book was a total win for me!! It's set in the future where crime is treated a whole lot different than it is now. And it's set in a prison called Alcatraz 2.0...funny enough, I visited Alcatraz in CA when I lived there maaaaaany years ago. It was really creepy. And what makes it even more different: it has a reality tv show. Wow. The characters are great (I have a few favorites) and you kind of feel bad for some of them? Some of it can be a bit....descriptive with the gore. It was a thrilling, quick read but oh so good! !